As one of the top romantic destinations in the world, as well as one of the best known countries for it’s culinary skills, when it comes to combing food with romance Paris is no stranger to couples seeking to have their dinner served with a romantic flare. The city caters for every type of couple - whether you and your partner prefer cheap and cheerful, top notch dining or you’re looking for typical French cuisine, (you have to try snails once, right?!) Paris will never disappoint. Here is a mini ‘romantic food’ in Paris guide so you don’t miss out on any of the deliciously romantic opportunities available to you in the city of passion. On the top end of the scale you’ll find numerous luxurious, ever so sophisticated à la carte restaurants. Many of Paris’ top restaurants even boast a Michelin star or two. La Maison Blanche is a fantastic choice if you’re looking to sweep your partner off their feet. You have the option of dining inside the restaurant, or on a brighter day you can book a table on the terrace directly facing the magnificent Eiffel Tower. Other restaurants where you can enjoy an equally luxurious evening include: Les Ambassadeurs and Le Meurice. Paris is littered with hundreds, if not thousands of small bars, bistros and cafés which know no boundaries and sprawl onto Pairs’ pavement, turning the streets into tunnels of al fresco dining. There is no better place to watch the world go and enjoy a lovely croissant at the same time! 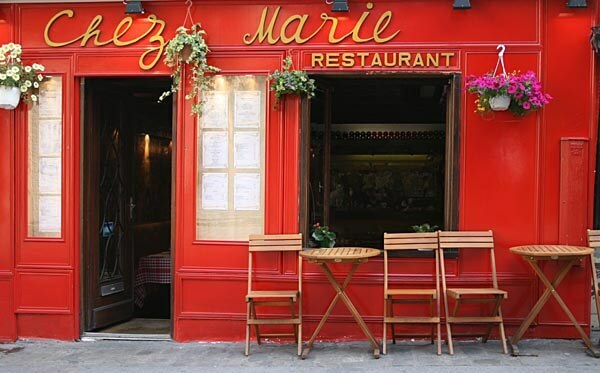 A particularly charming restaurant is Chez Marie. This quaint little gem can be found in the 18th arrondissement, up on the hill of Montmartre – the perfect place to stop for a spot of lunch after visiting the Sacre Couer! Painted bright red it’s hard to miss! Now, you can’t visit Paris, or France for that matter, without having at least one crêpe! 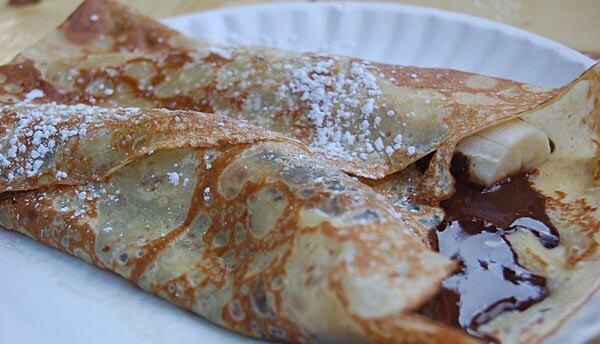 Crêpe stalls are on almost every corner in Paris and if you’re feeling peckish, although not the most obvious romantic food item (eating a chocolate covered crêpe without getting chocolate around your mouth, in your hair, or on your nose is no easy task! ), but a crêpe does have one great advantage… it’s portable! The number of places you can choose to take your crêpe to are infinite- why not head to the River Seine and enjoy your romantic snack on one of Paris’ glorious bridges? Or for a more secluded picnic you could try the spectacular Jardin du Luxembourg, or the beautiful Jardin des Plantes which is just around the corner from the Latin Quarter? 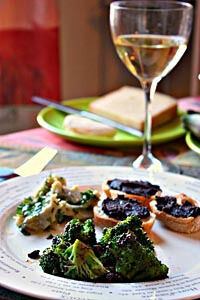 No matter where you are in the city you will never be disappointed by the Parisian cuisine. Can’t wait to get to Paris? Don’t waste any time in booking a Paris apartment for your holiday! Apartment rentals are better value than most Paris hotels, but there are of course cheap Paris hotels around that are good too. Of course, with an apartment you're having more space, and privacy too... quite good for a romantic night in after dinner. All that’s left to say is… Bon Appétit! Last updated by jack on 22 October, 2011 in Food And Drink. I've not tried nutella & coconut crêpes but it sounds very good. I'll try that next time I'm in Paris! Great article! Can't wait to get to Paris! Chasing up photos for this probably made me gain a couple of pounds... Glad it worked on you too. Now that left me hunger! Looks amazing!